Eighty-five years ago today, Clyde Tombaugh found a small dot of light shifting position while hunting for the trans-Neptune planet predicted by Percival Lowell. Now, the New Horizons probe en route to Pluto has photographed its tiny moons, Nix and Hydra. Nix and Hydra were discovered by New Horizons team members in Hubble Space Telescope images taken in 2005. 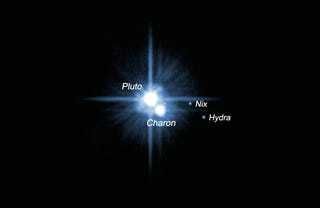 Hydra, Pluto's outermost known moon, orbits Pluto every 38 days at a distance of approximately 40,200 miles (64,700 kilometers), while Nix orbits every 25 days at a distance of 30,260 miles (48,700 kilometers). Each moon is probably between 25-95 miles (approximately 40- 150 kilometers) in diameter, but scientists won't know their sizes more precisely until New Horizons obtains close-up pictures of both of them in July. Pluto's two other small moons, Styx and Kerberos, are still smaller and too faint to be seen by New Horizons at its current range to Pluto; they will become visible in the months to come. The New Horizons spacecraft took these long-exposure photographs between January 27th and February 8th while it closed the gap from 201 million kilometers to 186 million kilometers (125 million to 115 million miles) from the dwarf planet. The paths of Hydra (yellow diamond) and Nix (orange diamond) were captured in these 10-second exposures. 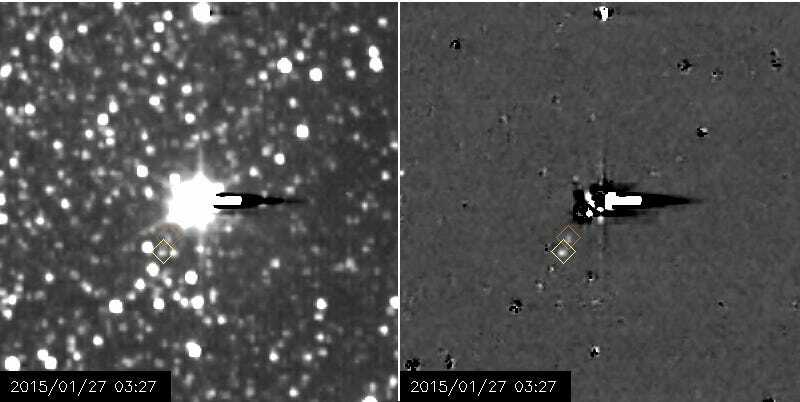 The dark streak is a camera artifact from overexposing Pluto and its more famous moon Charon; it shifts position as the camera and spacecraft were rotated to avoid losing the miniature moons within the obstruction. The image on the right is even more heavily processed, highlighting the moons while losing the background stars entirely. Pluto has come a long way since it was first spotted under a century ago, yet still hasn't made an entire circuit around the sun. In contrast to the 25- to 38-day orbits of its mini-moons, a single orbital period for Pluto takes nearly 2.5 centuries. New Horizons will be sending home photographs better than Hubble's best efforts starting in May, and will make its closest approach to Pluto in July.